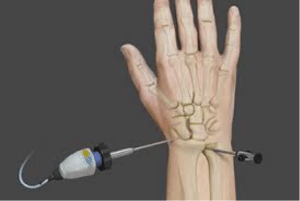 The technique known as wrist arthroscopy allows skilled surgeons to diagnose and treat many problems relating to the wrist through a series of small, minimally invasive incisions. The result for patients is a faster recovery period with less pain, stiffness and swelling following surgery. Over the course of the past several years, the wrist has become the third most common joint to undergo an arthroscopy, after the knee and shoulder, according to the American Society for Surgery of the Hand. So what exactly is wrist arthroscopy and how do you know when a patient is a good candidate for such a procedure? Several small incisions are then made along the wrist so the surgeon can view the wrist from different angles and place various instruments into the wrist to help observe, diagnose and treat the area. Typically, the surgery will last anywhere between twenty minutes and two hours. Wrist arthroscopy is often performed following a patient-reported injury, or they develop a feeling of pain, clicking or swelling – all of which may be indicative of an internal issue within the wrist. Dr. Katcherian sees many wrist patients that have been referred from their primary care physicians after being diagnosed with persistent acute or chronic wrist pain. If the patient has failed the conservative measures of healing, such as splinting or NSAID’s, or if the patient is complaining of wrist instability or ulnar sided wrist pain, he says it may also be time to refer them to a hand and upper extremity specialist for further testing. Following wrist arthroscopy patients are put in a protective bandage and, typically, a wrist splint will also be used to keep the wrist straight while still allowing full mobility of the fingers. Patients, as the case with most surgeries, will be given postoperative care instructions and told to elevate the arm to avoid excessive swelling and pain. At that point a follow-up appointment may be scheduled, as well as any additional physical therapy, should there be a need. Depending on what procedure was performed in conjunction with wrist arthroscopy, recovery time varies from several days with soft tissue debridement to several weeks or months if fracture fixation or soft tissue repair or reconstruction is performed.